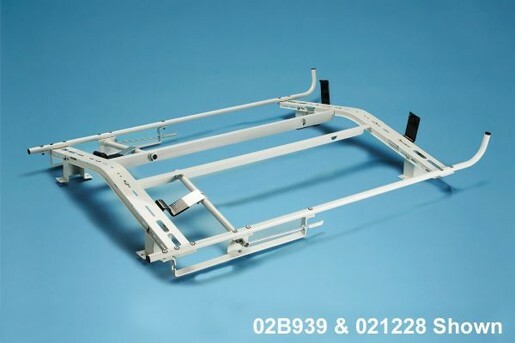 Actuator handle pivots the ladder to the side of the van for safe, efficient operation. Zinc plated and powder coated for maximum outdoor protection. All ladder contact areas are protected with vinyl covered stops and anti-skid strips. Includes padlock feature for security. Adjustable to fit different extension ladders. 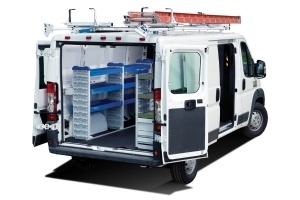 The Masterack® Locking Ladder Rack is unequalled for ease of use and dependability. 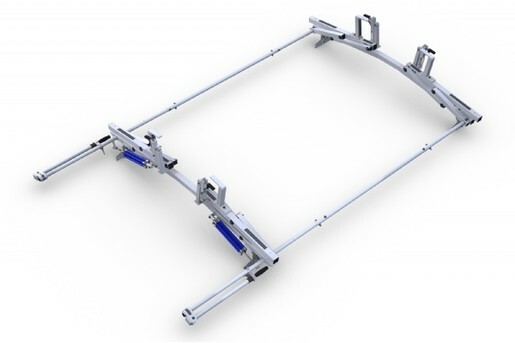 Easy-to-use clamping action secures ladders in place. Ladders are easily loaded and unloaded from the side of the vehicle for safe, efficient operation. Zinc plated and powder coated for the maximum in outdoor protection. 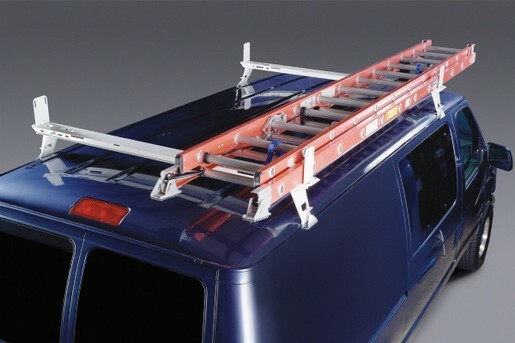 With only one moving part, this ladder rack is designed to be maintenance free for a lifetime. 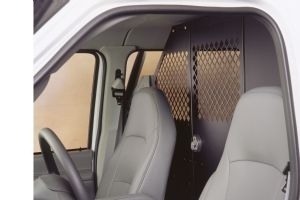 Full size van racks clamp to drip rails for easy installation. 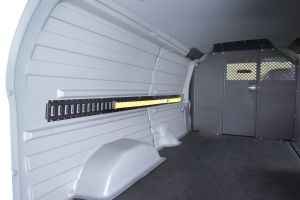 Transit Connect racks include roof mounted bolt-through feet and reinforcement plates; some drilling is required. Adjustable to fit different ladders. Award winning aluminum ergonomic ladder rack solution. Hydraulic cylinder reduces muscle strain. Improves gas mileage by being lighter than similar steel ladder rack solutions. Reduces install time and improves resell with no holes to drill. 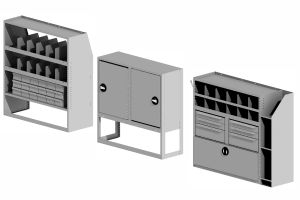 This lightweight interior has aluminum shelving, toolbox cradles, full-length drawers, and a full line of customizable accessories. 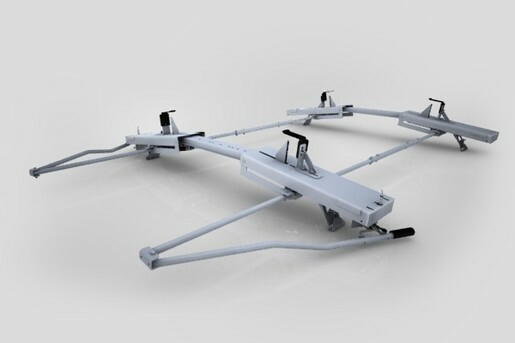 The aluminum is 30% lighter than steel with the ability to support a comparable capacity. 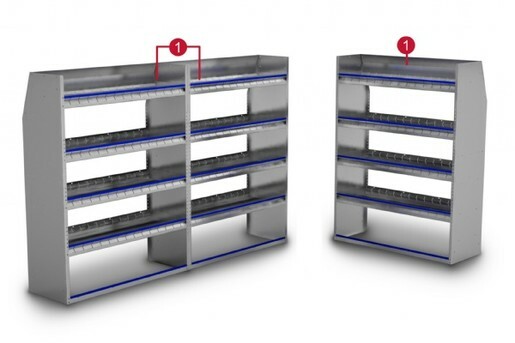 Our aluminum shelf modules are made in the U.S.A.